When I went out to hook up the boat at 2:15 AM I saw the bright bright moon. Thought oh boy that could make for an interesting bite. We were hoping for a couple of king bites so set up and 80 feet of water just north of the wreck off the towers. Lots of bait balls and hooks but when there was enough light to see the water looked off-color and green. So I headed more easterly and didn't get bit until we hit 120 and it was a double on a 150 copper and 200 copper both with Brad's cut plugs and big Al flashers. We decided to continue more northerly staying around 120 feet. 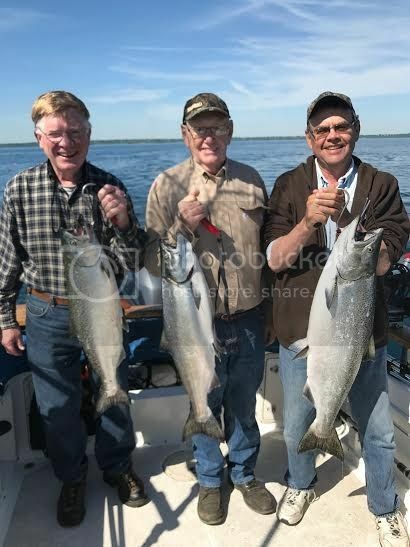 We would get a bite here and a bite there and then we did pop a nice king on a 150 copper with Brad's Seahawk and big Al Aurora blue/pearl. We were all the way up to 12 N. so turned back south and it remained kind of slow with more drive-bys than hook ups . We were hoping the late morning full moon bite would happen. It did!!! At about 930 we had a quadruple landing three kings. 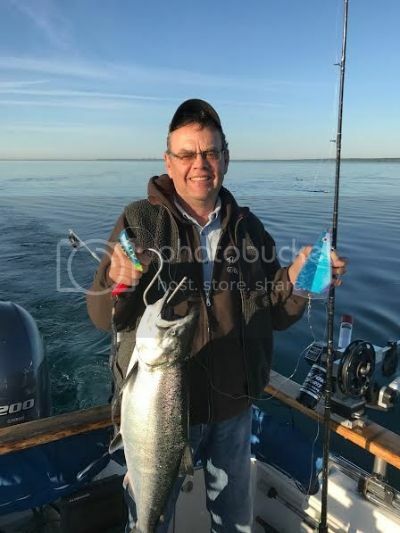 A 13 pound, 14 1/2 pound and 18.75 pound and the coho escaped. Let me tell you we were darn pleased and excited and wondering what it's going to be like when more of them show up. Three of the four kings were hatchery raised. We circled that area a while and picked up a couple more coho in the next hour or so. We got our count up to one short of our 4 man limit and started trolling south. Two hours with two drive-bys and decided to call it a day one short. 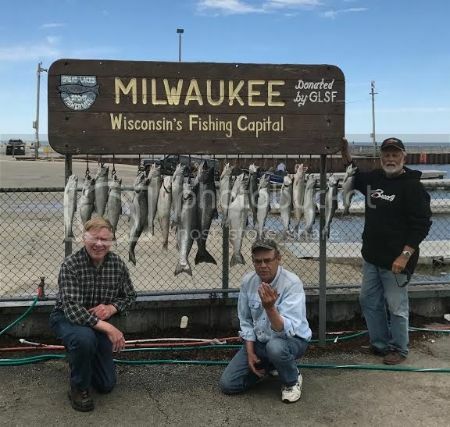 Ended with 4 kings, one rainbow, one lake trout and the rest coho. We should have been done much earlier. Our batting average was the worst for this year. It was much like others reported for that day going 19 for 36!! Surface temperature about 56 and 48 down 60. I should thank Silver King charter for some of our success. We were trolling northerly and he was gaining on us and I could see his net moving a number of times. So I pushed the speed to 2.4-2.5 on my TX 10 Depth Raider and pulled off my Dodgers replacing them with Big Al's on the riggers. Back at it again same time Friday morning finding some South East rollers that cooled the surface down to 52.5. I wonder how those south easterly’s do that? Set lines 90 feet of water short of yesterday Kings by about a mile. We boxed three Coho while setting lines. We got close to yesterday's King waypoint and the SWR rigger down 60 feet with an old Fuzzy Bear solid glow green that I covered with UV tape fired just like it had the day before. We had a dandy on for almost 10 minutes and much to our surprise and chagrin it fell off. Then the full moon lull, no bites for over two hours. Wandered around in various directions between 100 and 150. Then I got a call from my buddy Fellowship who had more fish and more bites fishing solo than we did with 12. At that time he was about 1 1/2 mile south of us but out in 168 feet of water. I decided to go due east to hit that contour then fish south. Shortly after getting to that depth and after that long lull a quadruple!!! We circled that area a few times getting one or two fish per pass. All they seem to want was tuna and big Al's. So I put it on almost everything. Then things slowed and the north east wind started to pick up. Decided to fish with the waves towards home and kept getting bit once in awhile. Hook up rate way better than yesterday until the end when we went one for four. 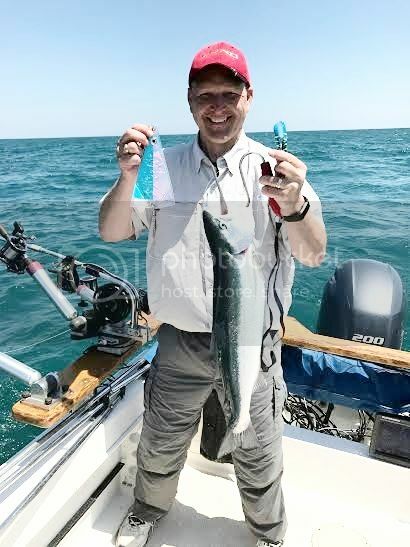 The one was a nice rainbow on the old reliable 150 copper With Brad's Seahawk and Big Al Aurora blue/pearl. Ended with one bow, one Laker and the rest Coho. 16 for 21. Not sure why I get up so early when there is a full moon. It was a little tough two days in a row but this remarkably good fishing is worth it. Also glad I did because for most of the upcoming week the wind forecast makes me think it's time for bluegills. Too many bites in two days to keep track. Thursday was a copper and dipsy day. Friday it was a rigger and dipsy day. Unlike others 2-5color virtually dead water.